Photo by Anton Bielousov via Torontoist’s Flickr Pool. Several agencies on the frontlines helping Toronto street-involved residents called an emergency press conference April 18 to address the city’s ongoing homelessness crisis. 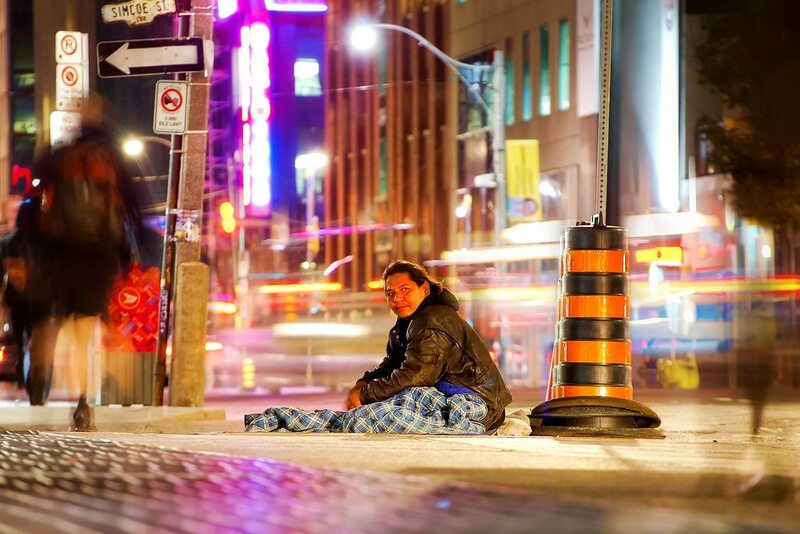 Toronto’s homeless shelters are currently at 98 per cent occupancy. Funding is dwindling. Seven homeless people have already died on the streets of Toronto this month alone. And now that Out of the Cold Shelters are closed until October, agencies serving the homeless are worried that the death toll is going to rise even further. Out of the Cold offers more than a warm place to sleep. The shelters are among the few equipped to provide frequent medical assistance and decent conditions so people are comfortable. Those basics are in dangerously short supply, according to folks at Street Health, an organization that provides nursing care for homeless people. For four months out of the year, Out of the Cold gives homeless folks a chance at accessing life-saving care and shelter that is totally out of reach during the other eight months, putting people at extraordinary risk of severe injury, sickness, and death. No similar program exists for the rest of the year, though chronically underfunded drop-in centres and shelters try to accommodate however they can. But as Street Health executive director Kapri Rabin told the crowd on Tuesday, merely extending the Out of the Cold program—as the City proposed—is nowhere near enough to address the homelessness crisis or provide adequate conditions for people to survive. “We’re holding this press conference to ask the City two things,” said Rabin. “The first is to open 300 emergency spaces to replace the spaces that were closed, using public spaces like gymnasiums or armouries.” These spaces, she says, are equipped with basics—such as showers and decent sleeping room—that we are in desperate need of. Rabin also demanded that the City adhere to its mandate and introduce immediate measures to reduce the shelter occupancy rate to 90 per cent, including opening up 1,000 new beds. The demand is also a plea. Toronto has some of the most expensive and unequally distributed housing in the country. Yet there is little room in city hall’s austerity agenda to fund overdue measures, like emergency housing funding, rent regulation, or opening new shelters, aimed at addressing the deadly consequences of Toronto’s poverty crisis. No representatives from city hall were present at the press conference. These consequences are especially severe for women, according to Patricia O’Connell, executive director of Sistering, a drop-in centre for women. O’Connell says that the centre is constantly over-capacity; but with women’s shelters at 99 per cent occupancy, homeless women have no place else to go. When the Out of the Cold program began, city hall saw it as a short-term solution to help alleviate the strain on Toronto shelters. Now, 30 years later, the City is still relying on an already-exhausted volunteer sector to provide the vital services that require full-time staff. But that status quo is dangerously unsustainable in light of climbing deaths and closing shelters. “It’s unconscionable that in a city as rich as Toronto, we do not have adequate shelter and housing,” said O’Connell. She added that beyond the short-term goals of increasing emergency beds and reducing occupancy, the City also needs to take immediate action on affordable housing. Austerity is not an option.